Is í Tulsa an dara cathair is mó i stát Oklahoma, agus an cúigiú cathair is daichead is mó sna Stáit Aontaithe. Is í príomhbhaile chontae Thulsa í.
Ba lonnaíocht de chuid na Muscógach í Tulsa sna 1830í. Tháinig an t-ainm ó Tallasi, focal a chiallaíonn 'seanbhaile' i Muscóigis. Go luath sa 20ú aois tugadh "Príomhchathair Ola an Domhain" ar Thulsa mar gheall ar a thionscal ola. Ins hochtóidí, áfach, tugadh an teideal do Houston i dTexas agus an ola á hídiú timpeall Thulsa féin. Tá iomrá ar Leabharlann McFarlin in Ollscoil Tulsa de bharr a bhfuil de bhunleaganacha shaothair James Joyce ann. 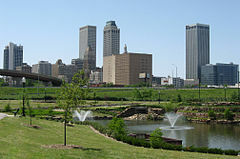 www.cityoftulsa.org - Suíomh idirlín oifigiúil. Tugadh an leathanach seo cothrom le dáta an 8 Iúil 2017 ag 22:49.